Three high-value cars have been stolen from a showroom in West Lothian. The cars, all Audis, were taken from the Calder Motor Company premises on the Camps Industrial Estate in East Calder sometime between 1.30am and 6am on Tuesday. In addition to the theft of the vehicles - which have a combined value of £75,000 - police said "significant" damage was caused to other vehicles and the showroom itself. Detectives are now investigating the theft and have appealed for anyone with information to come forward. Detective constable Andrew Young of Livingston's Criminal Investigation Department said: "This was a high value theft and we are eager to trace those responsible as soon as possible. 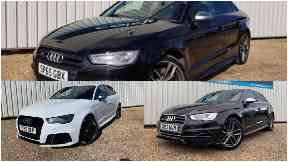 The stolen cars are a white Audi RS3, registration YF65 XLP, and two black Audi S3s with the registration numbers GU63 NGN and SP65 GBX.